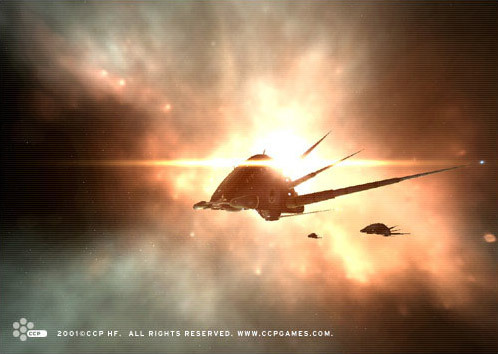 Anyone who travels for a while around the world of EVE will sooner rather than later run into strange-looking ships that more likely than not will prove hostile. These ships with their aggressive spikes and multi-toned metal shine are the not-so-old relics of a mad scheme hatched to conquer the world. Today, this once glorious fleet is left to guard the ruins of a dynamic empire, the marvel of the world a century ago. Hailed as the perfect Utopian state it wasn’t until the gruesome tales of its ethical transgressions surfaced that it was brought down through a joint effort by all the major empires. It is the norm whenever breakthroughs occur in the technological or geographical knowledge that some people manage through luck or foresight to make a fortune on the new knowledge. This is exactly what happened in the heady days of space exploration and colonization in the first few decades after first contact, when anyone with the means and the motives could set himself up as a space baron in a pocket of space somewhere outside empire territory. One of these early tycoons was Sansha Kuvakei, a wealthy industrial mogul of Caldari origin. His family had made its fortune in armament manufacturing during the war with the Gallente Federation. Sansha soon showed himself to be an eccentric megalomaniac that dreamt of world conquest, no less. He saw the free-for-all colonizing of space that the empires advocated at the time as an ideal vehicle for his schemes and set out to carve himself a sizeable chunk of the systems available to the public. Sansha saw himself as a visionary for the new order soon to come and he attracted thousands of followers, attracted by his charm and promises for a better future for everyone. Soon Sansha had built himself a sizeable domain extending over several systems, with smaller pockets scattered around the known world. This foundation allowed Sansha to start his own armaments program, independent of all the other empires. For this he used the extensive knowledge his family had garnered throughout the years. For years Sansha’s build-up program continued, gaining ever more momentum as his fame and fortune increased. Being on the forefront of space mining and trading his realm prospered and soon people were talking about Sansha’s Nation (as it was most commonly known as) as the new major player in galactic politics. Sansha used these resources ingeniously to create an image of himself as a new messiah and his domain as the Promised Land. But when Sansha himself started believing the hype heaped on him his already fragile mind conjured ever-stranger notions and plans. One of these projects was to develop a method to amalgamate the recently introduced Jovian capsule technology with existing brain implants, most of them illegal, to create men with the thoroughness of a computer and the ingenuity of humans. People that would be completely loyal and dedicated, yet creative enough to handle complex and delicate situations. These inhuman researches naturally required test subjects, Sansha acquired these from the Amarr Empire in the form of Minmatar slaves. The Amarrians were eager to learn of any new techniques to be used to control their large slave population and gave Sansha whatever support he required. There has always been strong suspicion that Sansha received substantial support from others too, but if and who these shadowy allies were has never become public knowledge. Sansha’s dream was that these zombie-like creatures could be used as soldiers and guards, thus freeing humans to pursue more peaceful and productive lifestyles. He also experimented with ship crews and captains, as he regarded space ships to be both boring and dangerous, and thus ideally suited for his creatures. Soon, all armed forces and space ship personnel employed by Sansha’s Nation had been replaced by an easily controlled armada of True Slaves, as those that had been implanted with Sansha’s technology became known as. In his warped mind Sansha believed his acts to be of the good for mankind. It was only a matter of time before the truth of this new technology was revealed to the public. The reactions were immediate and intense. One by one the empires condemned Sansha, the Amarr Empire among them, as they didn’t want to be ostracized by the other empires. But Sansha refused to see the error of his ways, declaring that the other empires were too narrow-minded and primitive to fathom what a great genius he was. Sansha continued to put his mind-curbing devices into people unabated and even started some even more outrageous projects in the same vein. In the end, the other empires, with the Gallente Federation at the forefront, decided not to stand idly by any longer and attacked Sansha’s Nation. Since the revelation of Sansha’s twisted experiments came out into the open, the Nation had lost most of its inhabitants. Only the fanatics and the True Slaves remained. They managed to hold out for some months, but in the end Sansha’s little empire crumbled. His forces were scattered to the wind and all his factories and space installations destroyed. Sansha himself was killed during the final assault on his stronghold. But even if the majority of his fleet had been defeated, many of them managed to slip away during the chaos and hide. These are the ships that still today attack unwary travelers in the vicinity of the old realm of Sansha’s Nation. Steered by True Slaves they have never given up the fight that Sansha sent them out for, a disturbing tribute to their late master. After Sansha was defeated the empires debated what to do with the systems he controlled. Finally, they were distributed between the empires, but it’s attesting to the lasting effects of Sansha that almost none of them have been settled in the decades since his collapse. As a final note, there are those that claim that Sansha is still alive and well. These conspiracy theorists say that before he died Sansha hid a number of clones of himself in secret locations the empires never discovered, and after he was killed he was resurrected in one of them. The same rumors also state that Sansha is still up to his old tricks creating True Slaves and building ships, hidden amongst the rubble in some remote corner of his old domain. They argue that the number of True Slave ships destroyed in recent years is far greater than the number of ships that remained at the time Sansha’s empire collapsed. As with most good conspiracy theories, it is hard to prove or disprove any of these claims.